Contact us today and discover all the benefits of joining our exclusive BT-50 fleet program. What is the BT-50 Fleet program? The BT-50 Fleet Program meets the needs of small to medium business customers who are interested in purchasing Mazda vehicles for inclusion in their fleets. There are two tiers of discount avaliable depending on the size of your fleet. Small Fleet – For Primary Producers and ABN holders Business Fleet – For businesses with in excess of 10 vehicles in their fleet. Apart from price discounts, what are other benefits? 12 month/ 15,000km service intervals to minimise the amount you need to spend on your vehicle servicing. Our service calculator can help you budget for this expense. Am I eligible for the BT-50 Fleet program? To be eligible for the Mazda BT-50 Fleet program, you need to be a business buyer or primary producer, and hold a current ABN. Why join the BT-50 Fleet Program? By joining our fleet program, you’ll get a comprehensive plan and discount structure to suit the type and size of your business and budget. You’ll have access to the BT-50 range of vehicles; these have achieved the highest levels of performance, design, equipment and functionality possible within the light commercial utility market. What paper work do I need to provide? For a business running a fleet of less than 10 vehicles (of any type or brand), all you need to provide is your current ABN. If your business runs 10 or more vehicles (of any type or brand), in addition to providing your current ABN, you’ll need to confirm the number of vehicles you run. We have a form you can complete for this purpose. (Mazda BT-50 Fleet Program Registration Form). What if I have ten subcontractors but I don’t own the cars myself? Vehicles driven by full time contractors are eligible for the BT-50 Fleet Program, and are included in the calculation of your fleet size. For a contractor to purchase a BT-50, the business owner/fleet manager is to complete a letter confirming the full time status of the contractor, on business letterhead. How will you check I have counted my fleet correctly? To check that fleet numbers are correct, a registration form confirming the ownership of the number of vehicles is required (ie Mazda BT-50 Fleet Program Registration Form). Are motorbikes, trucks, tractors included? Motorbikes, trucks and tractors are included in the calculation of a business’s fleet size, as long as they are registered using the company’s ABN. The Mazda BT-50 delivers a premium light commercial ute, impressively powerful and with generous payload and towing capacities that are among the biggest around, this ute will take you everywhere, looking good, and in comfort. You’ll get athletic design instead of boxy thinking with entertainment and technology in a cabin that’s more car than truck. With Mazda BT-50, you will have a choice of configurations with various body styles from the entry-level 2WD single-cab chassis with manual transmission, through to the range-topping dual cab GT 4X4 auto model. Why would I buy a BT-50 over a competitor? With the full range including Single, Freestyle and Dual Cab, you can experience its performance through our Mazda BT-50 Fleet Program. With more Mazda Dealerships located in metropolitan and rural areas around Australia, you are covered nationally for after sales service. What is the warranty coverage on a BT-50 purchased as part of the Fleet Program? A comprehensive warranty on BT-50 parts and panels will give you complete peace of mind and confidence. BT-50 has a five-year, unlimited kilometre warranty, whichever comes first. How much are on the road costs? Your Dealership will quote a price that includes on road costs, with no more to pay. As a fleet customer, may I get both fleet incentives and retail discounts when purchasing vehicles? As a fleet customer, you can be sure to get the best available price as our fleet discount is in addition to retail offers. Can I get discounts for vehicle accessories? All accessories are backed by Mazda’s 5 year Warranty to protect you if something doesn’t go to plan. I bought a BT-50 last month; can I claim a discount for my purchase? You are not able to claim a discount retrospectively, that is, after you have purchased a vehicle. The BT-50 Fleet Program will apply from your next purchase. At the time, we will ask you to complete a BT-50 Fleet Registration Form if you run a fleet of 10 or more vehicles (of any type or brand). Does Mazda have capped price service programs? Mazda Service Select is offered with all BT-50 purchases. Under Mazda Service Select, we recommend service every 15,000km or not longer than 12 months, whichever comes first based on the use of the vehicle. The cost of servicing your BT-50 is published on our website and is guaranteed not to exceed the published cost. This ensures you can effectively budget the running costs of your fleet. Can Mazda offer a preferred/priority booking service as I cannot afford time without my vehicle? How often does my vehicle need to be serviced? 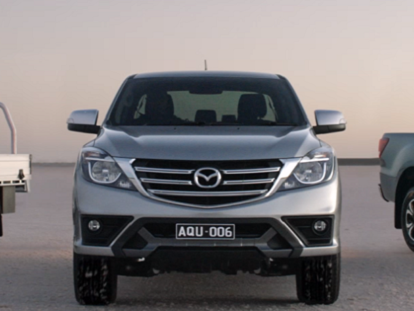 Mazda BT-50 scheduled services are due every 15,000kms, or not longer than every 12 months, whichever comes first. Premium roadside assistance program is important for me; can Mazda provide a program with guaranteed same/same replacement Mazda vehicle for tow away/VOR situation? Mazda’s Premium Roadside Assistance program offers services, to resolve problems such as flat batteries, locked in keys, accident support and flat or damaged tyres. Mazda can offer additional benefits including accommodation, a rental car, or vehicle recovery should you break down more than 100kms from your business for longer than 24 hours.